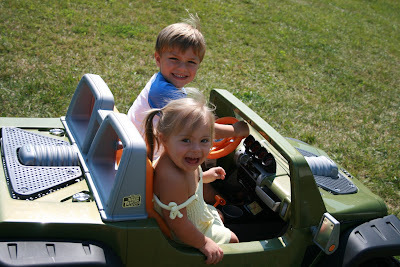 The kids spend a lot of time right where you see them ... in the Jeep. Driving circles around the backyard ... in the Jeep. If one goes, the other goes ... in the Jeep. Spending time together ... in the Jeep. OMG that is too cute!! OMG Koby has one of these jeeps and has learned recently to steer it really well ( after some adjustments from Pawpaw) and it is his FAVORITE too!!!! Your kids are precious!!!! ps: I added your blog to mine...I love it!